Happy Halloween, fair readers. Today's posting will be all-Hallows style, and nothing else (and if it looks like a straight news post, understand that the news scares the hell out of me, and probably should you). Not a bad way to pop the question, eh? Click the extended entry to read the CNN backstory. 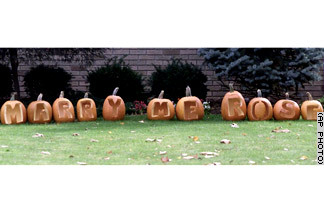 A line of carved pumpkins spells out “Marry Me Rose” on the lawn of Rosemarie DelRoio's home in Scotch Plains, New Jersey, October 21. DelRoio's boyfriend, John Pearce, used the pumpkins to propose to his sweetheart while they were both walking through a nearby cornfield maze. She accepted.